Matt Holliday homered twice and drove in four to lead the St. Louis Cardinals over the Cincinnati Reds 14-3. Hollliday’s two lead a six home run attack from the Cardinals. Aledmys Diaz and Brandon Moss each added three-run homers to help the Cardinals to their sixth win in the last seven games. They have scored seven or more runs in all six wins and hit double-digits four times. Randal Grichuk and Matt Adams also homered. Adams’ pinch-hit homer was the second of the game and sixth of the season. That surpasses the Cardinals total of four from pinch hitters last season. 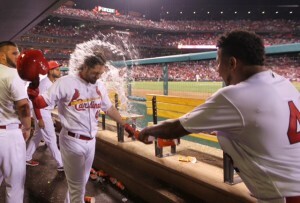 Carlos Martinez picked up his second win of the season allowing three runs and six hits over seven innings. He struck out six and walked one.